My Lords, Ladies and Gentlemen, welcome to the inaugural annual Total Flanker Awards ceremony where we reward those who have contributed to a feast of rugby in 2007. I should mention before we start that the selection committee have chosen to discount the Super 14 and Tri Nations from its deliberations on the basis that the two tournaments were rendered meaningless, in the former’s case by Graham Henry’s decision to “rest” New Zealand’s top players from the first half of the competition, and in the latter’s case by Jake White choosing to send a second string squad to play Australia and New Zealand. Northern hemisphere teams are quite rightly derided for sending weakened squads down south on their spring tours, but would never dream of devaluing the Six Nations in the same way. I should also mention that, being the world’s rugby showpiece, the Rugby World Cup does tend to dominate these proceedings. The committee acknowledges that there’s been plenty of quality rugby elsewhere but, in the majority of awards, I’m afraid all roads lead to France. First up is the Total Flanker Achievement Against the Odds Award. The committee thought long and hard about this one before ignoring the claims of yours truly for making a comeback to the rugby pitches of Buckinghamshire after a 14 year absence from the game (I may have mentioned this before somewhere on this blog ;) ). Quite rightly Argentina were contenders for this award for reaching the World Cup semi finals (despite many – including myself – predicting they would lose out to France and Ireland in the pool stage) as were England for reaching the World Cup Final from pretty much an impossible position. However the clear winner was Graham Henry for managing to get re-appointed as the All Blacks’ coach despite the worst Rugby World Cup effort in New Zealand rugby history. Next up is the Total Flanker Biggest Disappointment Award. The committee acknowledges that this award is particularly subjective and depends entirely on ones perspective. 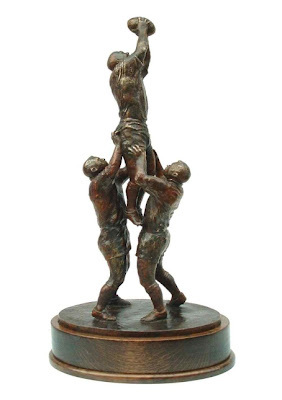 New Zealanders, in particular, will be convinced that the All Blacks' failure to progress beyond the World Cup quarter finals should make the recipient of this award a no-brainer and the Welsh will insist that failure to beat Fiji to progress beyond the group stages should place them amongst the leading contenders. However, being as objective as possible, the committee considered that the biggest disappointment was that of Ireland. Given the expectations before the World Cup and given the claims that this was the most experienced and best prepared squad ever to leave the shores of Ireland, their underperformance at the tournament must have just been bewildering for Irish fans. Even accepting that progress from the “pool of death” was far from assured given the strength of France and Argentina, nothing can quite explain Ireland’s lacklustre effort against Namibia or the near disaster against Georgia. So, now to the Total Flanker Best Decision of the Year Award. Only two nominations for this one and both of them are Jake White! His decision to bring Aussie Eddie Jones onto the South African coaching staff was inspired, creating the illusion that the Springboks had switched emphasis to a more open running style. This was, of course, nonsense as in all of South Africa’s big games in the World Cup it was the traditional virtues of an immense lineout effort and awesome defence that won through. No, the award goes to White for having the common sense not to re-apply for the post of Springbok coach ensuring that, unlike Woodward post-2003, White’s reputation and legacy as a World Cup winning coach remain intact. Moving on to the Total Flanker Worst Decision of the Year Award. “Wayne Barnes!” I hear the Kiwis shout, but which referee hasn’t missed a forward pass in his career? No, amidst several poor decisions, including Brian Ashton choosing Lawrence Dallaglio for his World Cup squad and the decision by the TMO to award Jonny Wilkinson a try in this year’s Calcutta Cup encounter, one still stands out above all – the IRFU’s decision to hand Eddie O’Sullivan a four year contract extension BEFORE the Rugby World Cup. Pure genius! Nearing the end now, and it’s the Total Flanker Pull the Other One Award. The Ospreys recent claim that Gavin Henson broke his hand during the recent Anglo-Welsh clash with Harlequins (and not during the subsequent drunken punching game on the train home), is a credible late entry for the honour of this award, but it’s not enough to unseat Lawrence Dallaglio, whose attempt to persuade us that he was still an international rugby player during the England v USA pool match sees him win this one hands down. Total Flanker Should We Be Worried? Award – IRB. Flanker, you make some pretty compelling cases. You can almost make a new category:"The Judas Award", for the biggest turncoat Rugby player. Given what a snake in the grass Dallalgio has proven to be with Ashton post-world Cup, I think he would win hands down. I have to say that France, Ireland and Wales would all be candidates for most disappointing. I do have to say that given how close Ireland was to winning the six nations to it's woeful form against the French, Argentines and Namibians do give them the nod. How Graham Henry has managed to keep his job is still a mystery-and I'm a neutral Yank looking in at all of this. Graham Henry apologists will tell you that suddenly the World Cup isn't the be all and end all and that the All Blacks' overall record during Henry's four year tenure justifies all. This does, however, ignore the fact that Henry as good as promised that his rotation policy and conditioning programme, both deeply unpopular with the NZ public, would deliver the World Cup. Put in very simple terms, his re-appointment stinks...!